There have been, on occasion, bags of soup bones for sale in the butcher area of our supermarket here in rural China. I love using bones for soup – bones make the broth. So, on a fateful day not that long ago, I grabbed a bag of soup bones to put in my cart. 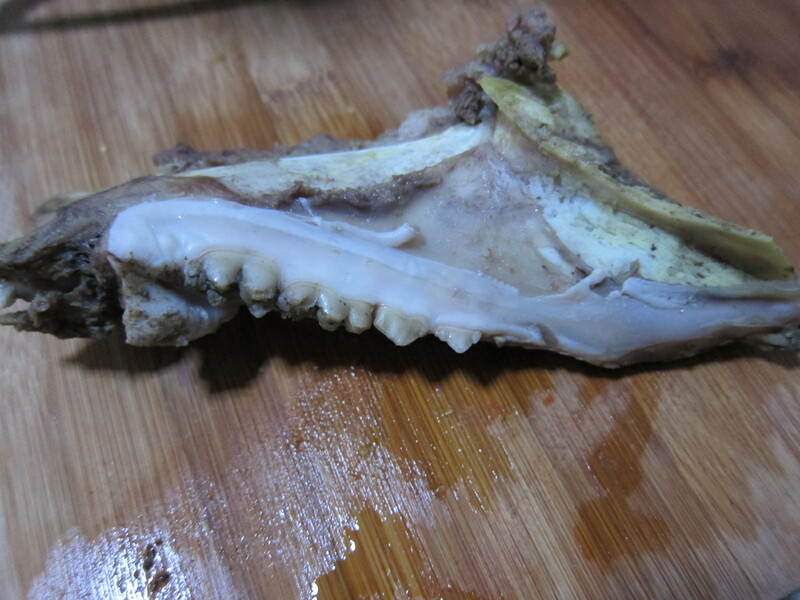 As I picked up the bag, I glanced at the label: 猪头骨, pig head bones. That’s different, I thought. I don’t remember it saying “head bones” before. But, into the cart they went. I didn’t think it would matter which of the pig’s bones I used, as long as they were bones. Later that day, I started making the soup. 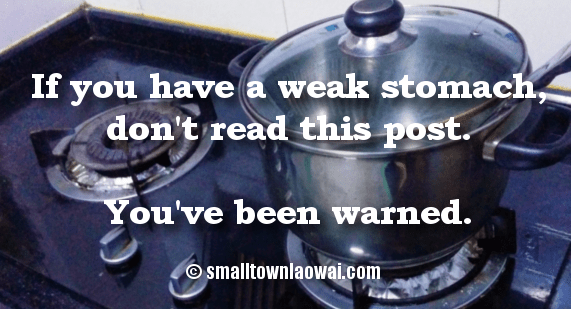 I put onions and water in the soup pot to boil. Then I opened the bag o’ bones and stopped short. The bones were all jaw bones. Jaw. Bones. AND THEY WERE FULL OF PIG TEETH. Really, should I have been surprised? 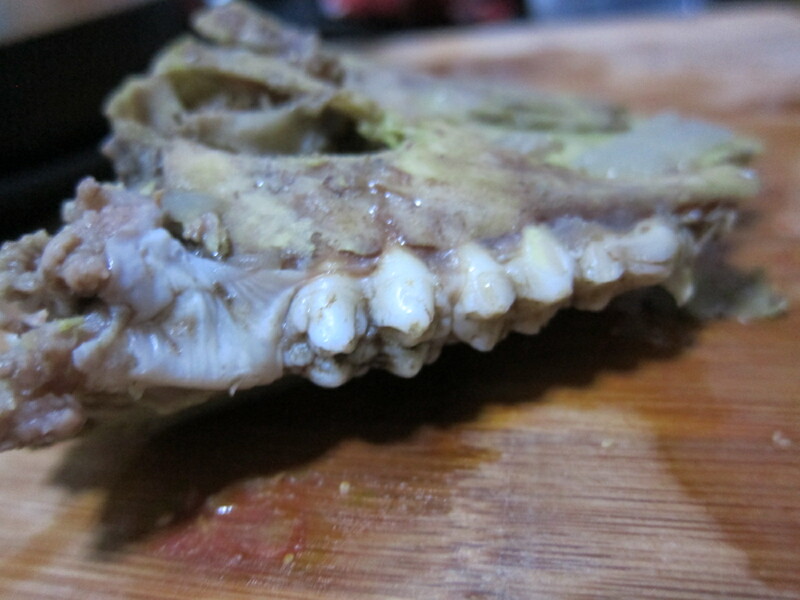 What other bones, after all, would come from a pig’s head? I suppose I was thinking the skull, not the jaw. I was certainly not imagining that there would be teeth. I paused there in the kitchen, wondering what I was doing. Was this crazy? But then the It Will Be Fine voice started talking. This is the voice that coaches me through situations that might otherwise cause me to lose it, like finding someone else’s blood on the comforter I’m using on the overnight bus, or being directed to the pig pen when I ask where the restroom is. Despite a few more valiant efforts and logical arguments from ICBTS (and all of you yelling at me like you’re watching a slasher film, trying to warn the person who’s about to go down in the basement like an idiot to investigate the weird noise), IWBF won out with the practical fact that this is what I had planned for dinner, and we didn’t have anything else. So there. 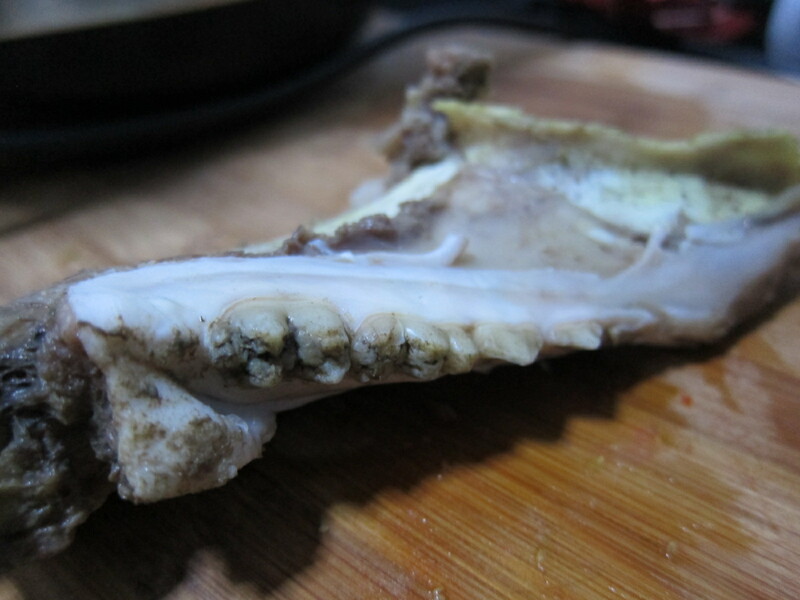 I dropped the bones into the soup pot, and cringed as the teeth scraped the metal sides. I stirred in some salt and put the lid on to let them boil while I chopped the rest of the vegetables. When the pot had boiled for a bit, I took the lid off to add the vegetables. The surface of the soup was covered in thick grayish foam, like the Exxon Valdez had collided with a tanker of Pantene. The smell was very…piggy. I stirred it a bit to get rid of the foam, and realized that the broth was an unnatural yellowish-green color. And there were the pig teeth, smiling up at me from the swirling liquid. Had I been trying for some witch’s cauldron as a horrible Halloween prank, I’m not sure I could have done better. At that point, there was nothing more the IWBF could say. She just stared at the horrid concoction along with me and ICBTS. We all agreed: There was absolutely no way we were going to eat that. Dinner was ruined. Beware bags of animal parts in China. But, golly gee, I think maybe you knew that long before you read this post. Ha! There seems to be a fine line between “optimism” and “foolhardiness,” and apparently that line gets crossed at times. So, I’m guessing you don’t want to come over for dinner some time? Ugh! I guess I’ll remember that for the next time I buy pig teeth, lol!